Info "Return the serve! That's all!" Served! is one of Jimmy T.'s microgames in WarioWare: D.I.Y. 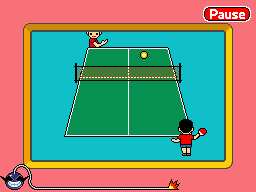 The game is based on the sport of ping pong. The point of the game is to rally the ball to the opponent's side. The player controls the black-haired character in the foreground. The game starts off with the opponent serving the ball to the player's side of the court. Using correct timing, the player needs to hit the ball with his or her paddle. If done correctly, the ball should rebound back to the opponent's court and the opponent misses, causing the player to win. However, if the player misses the ball, the game ends in a loss. This page was last edited on October 4, 2018, at 20:50.